Beans and lentils (legumes) are so good for you that I don't even know where to start. Besides being inexpensive, they are full of nutrition in the form of protein, calcium and other vitamins and minerals. They are low glycemic which makes them diabetic and metabolic syndrome friendly and are believed to protect us from heart disease, obesity and cancer. 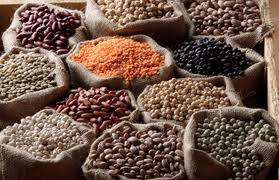 I especially love lentils - high in folate, magnesium, and iron they are packed with protein (26% of the calories), and fiber, and are known to lower cholesterol and stabilize blood sugar. Pair with a grain and you have a complete protein for a vegetarian diet. Just add veggies. I like to use sprouted lentils sold by the ShaSha Co. Sprouted grains and legumes have about 3 times the nutrients of unsprouted. These ones are organic and have been sprouted and dehydrated - all you do is soak them for half an hour and then cook them for 20-30 minutes. ShaSha also makes a nice sprouted short-grain brown rice. My favorite go-to recipe for lentils is a lemony salad made with bulgur and finely chopped vegetables. I can eat this salad 5 days in a row and I often do! Bring lentils, garlic, bay leaf and 3 cups water to boil; simmer for 20-25 minutes or until soft but still holding their shape. Drain, rinse with cold water and drain again discarding bay leaf and garlic. Omit this step if using canned lentils. Mix bulgur,salt and boiling water; cover and soak for about 1/2 hour. In large bowl mix drained lentils, bulgur, vegetables and feta. I have to confess that I don't really measure the fresh herbs so feel free to use more if you enjoy the flavors! Whisk till well blended and thick; pour on salad and mix well. Best if refrigerated an hour or two before serving. Makes 4-5 servings. I sometimes add a few halved cherry tomatoes when serving. I just recently started eating lentils. I love them with veggies and black beans. This sounds delicious. That is tomorrow's lunch taken care of!